The UK will drive the expansion of the EU offshore wind market, but developers must collaborate to become price-competitive with other energy sources in the future. 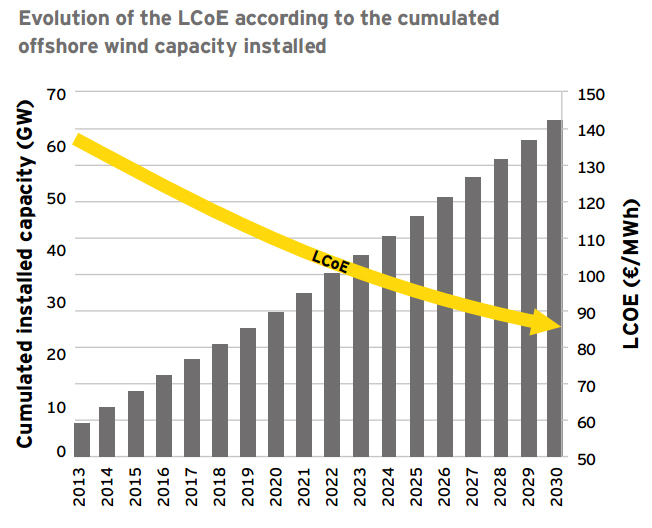 That's the conclusion of a new report released today by EY, commissioned by the Brussels-based European Wind Energy Association. The report found that the EU offshore wind industry could triple its capacity - from 8GW today to 23.5GW in 2024 - with growth expected "mainly from the UK market as well as a faster deployment in France and the Netherlands". The UK is already the largest global offshore market, accounting for more than 55% of capacity installed within Europe, followed at a distance by Denmark (16%), and Germany (13%). However, "the pace of growth in the industry now needs to be matched by an equal pace in lowering costs", according to the report. It specifically calls for bigger turbines, more competition, and better supply chain integration, which could all help in reducing outlays by 26% over the next ten years. If the industry successfully implements these cost-cutting measures, it could be be the second-cheapest energy source by 2025 in terms of Society's Cost of Electricity (SCoE). 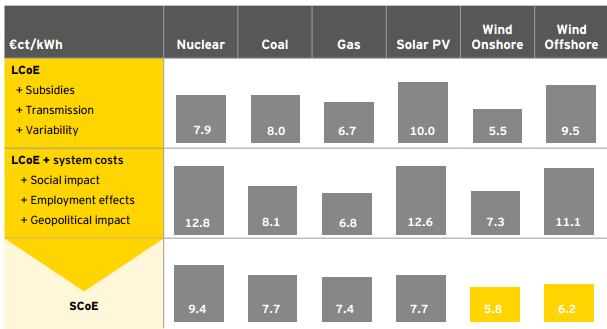 SCoE accounts for the cost of generation but also incorporates the macroeconomic costs and benefits of energy production - such as the volatility of fossil fuel prices or the employment benefits of wind. Alongside the release of the EY report, three of the biggest names in offshore wind - Dong Energy, MHI Vestas and Siemens Wind Power - have issued a joint declaration called 'United Industry' as part of a commitment to reducing costs in the sector. DONG Energy wind power vice president Claus Hviid Christensen said: "For offshore wind to realise its full and significant potential, we need to continuously reduce the cost of electricity. "The good news is that we are indeed on the right track, and we are already seeing the industry taking important steps forward with an impressive pace. With a clear political framework for the development of offshore wind power after 2020, I am confident that we will meet our target of making offshore wind fully competitive with alternative energy technologies." Last month, the European offshore wind industry called for policymakers to provide long-term funding certainty as new figures revealed the market slowed in 2014. In the UK, Decc provided that certainty to two offshore windfarms in its recent Contracts for Difference auction.